SpaceX is planning to conduct crucial tests of the launch-abort system on its manned Dragon capsule in November 2014 and January 2015. NASA is expected to announce its choice for one or more private astronaut taxis any day now, and SpaceX aims to be ready if its name is called. The California-based commercial spaceflight firm continues to make strides with its entry in NASA's commercial crew competition, a seven-passenger capsule called Dragon. Indeed, SpaceX has already met most of the milestones laid out in the most recent round of NASA funding, which is known as CCiCap (Commercial Crew Integrated Capability), and plans to have all the boxes ticked by January, company representatives said. "We have a pad abort test planned, and an in-flight abort test planned," Reisman added during the Aug. 27 talk. "The pad abort test is on track for November of this year, and the in-flight abort test is currently scheduled for January." 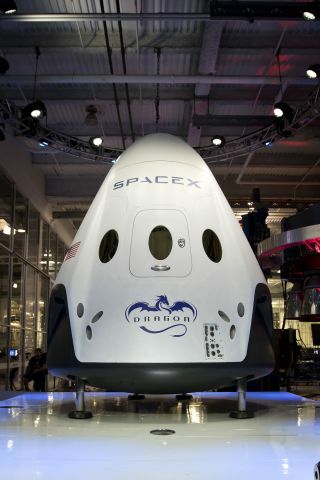 SpaceX's Dragon Version 2 spacecraft is a manned space capsule designed to fly seven astronauts to and from low-Earth orbit. See how SpaceX's Dragon V2 spacecraft works in this Space.com infographic. The United States lost the ability to transport its own astronauts to and from the International Space Station when NASA's space shuttle fleet was grounded in 2011. Ever since, the nation has been dependent on Russian Soyuz spacecraft to provide this service — for about $70 million per seat, in the most recent contract. NASA's commercial crew program is designed to change this situation by encouraging the development of homegrown private spaceships. The agency wants at least one American astronaut taxi to be operational by 2017. The commercial crew competition kicked off in 2010 and is now in the home stretch, with the final contract — known as Commercial Crew Transportation Capability, or CCtCap — expected to be awarded sometime this month. Four companies remain in the running: SpaceX, aerospace veteran Boeing with its CST-100 capsule, Sierra Nevada with the Dream Chaser space plane, and the secretive Blue Origin, which is developing its own Space Vehicle. More than one of these firms could get a contract, agency officials have said. "NASA has not specified a set number of awards under CCtCap," NASA officials wrote in a blog post last month. "In late August or September, the agency will select the company or companies that will build an operational space transportation system." SpaceX's upcoming abort tests are crucial. They'll show how the Dragon spacecraft — an upgraded, manned version of the capsule already flying robotic cargo missions to the space station for NASA —could respond in the event of a problem during launch. Both tests will take place at Cape Canaveral Air Force Station in Florida. In November's pad abort trial, Dragon will sit atop a truss structure rather than an operational Falcon 9 rocket, which SpaceX uses to launch the robotic capsule on cargo flights. If all goes according to plan, Dragon's onboard thrusters will lift the capsule away from the pad, as could be required in the event of a launch malfunction. "We're going to have a crash-test dummy inside and a prototype seat, so we'll get data from that," Reisman said. "We're going to have a very flight-like propulsion system as far as everything that goes into the abort, including the avionics, which are going to be identical to the avionics we plan for the flight vehicle." The in-flight test will take things a big step further, mounting Dragon to a modified Falcon 9 and attempting to demonstrate the capsule's abort system at altitude. SpaceX wants to win the NASA commercial crew contract, of course. But ferrying people to and from low-Earth orbit is just one step along the road for the company and its ambitious founder and CEO, billionaire entrepreneur Elon Musk. "The goal of the company is to make human civilization multiplanetary," Reisman said. "To do that, he [Musk] wants to create revolutionary space technologies that will enable, eventually, a large number of people to have a self-sustaining presence on Mars," Reisman added. "Everything we do is vetted by whether or not it enables us to get further towards accomplishing that goal."